Malvern will be part of an international campaign to celebrate the Commonwealth as five sapling trees were delivered to MP Harriett Baldwin’s local office. The Queen’s Commonwealth Canopy scheme aims to create a lasting physical tribute to the work of her Majesty’s leadership of the 53 Commonwealth nations. 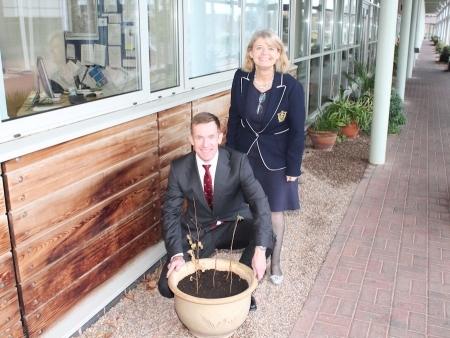 Harriett is one of hundreds of MPs who have been given a set of trees and these saplings have been donated to Malvern Hills Science Park to plant during the spring. Harriett commented: “This scheme will create a lasting tribute to the Queen’s leadership of the Commonwealth and trees are being planted all over the world in celebration of her achievements. “The donation of trees follows an inspiring television programme featuring her Majesty and David Attenborough, which people may have seen in the summer, and I’ve taken delivery of five trees so that Malvern can be part of this international celebration. “I was privileged to take part in the latest Commonwealth heads of government gathering in London earlier in the year and regularly see the importance of the network when I visit African Commonwealth nations as part of my Ministerial duties. Photo: Malvern Hills Science Park’s Alan White and West Worcestershire MP Harriett Baldwin take delivery of the five saplings to form the Queen’s Commonwealth Canopy.